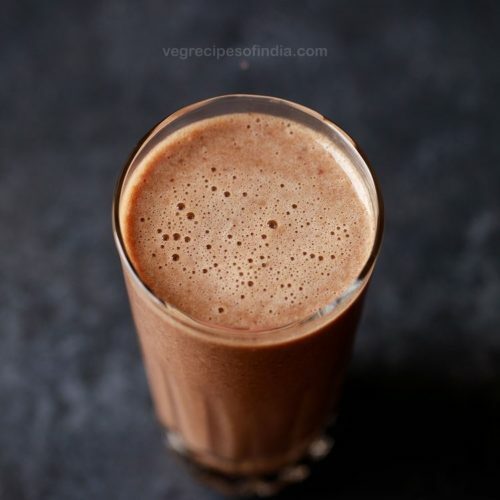 this cherry smoothie is a delicious smoothie made with almond milk. to thicken the smoothie, i have added 1 banana, but it can be skipped and you can use more cherries instead. rinse cherries in water first for a couple of times. then soak cherries in a bowl of water for 15 to 20 minutes in which ½ tablespoon vinegar is added. this is done to get rid of pesticides. later rinse cherries again a couple of times with fresh water. drain all the water. then remove the stems. pit the cherries and discard the seeds. you can chop the cherries roughly if you want. add the cherries in a blender. add 1 large chopped banana. pour ½ cup almond milk. you can also use thin coconut milk. add ¼ teaspoon vanilla extract. pour in a glass and serve cherry smoothie straight away.